Headdresses were an important part of the Mayans attire. Mayans embellished their headdresses with different decorative items such as feathers. The quality, outlook and sometimes the size of the headdress also denoted the social status of the wearer. The royalty, for instance, wore the most colourful and well-adorned headdresses of massive sizes. Nobility similarly wore well-made headdresses. The commoners were forbidden from wearing any such headwear. So the headdresses also served as a major part of social classification in the Mayan society. Mayan culture of wearing headdresses was directly related with the Mayan notion that elongated heads were a sign of beauty. Mayans nobility typically had their heads elongated and the foreheads flattened at a young age. Some men would burn the hair on their forehead to make it appear even larger. The remaining hair were then tied on top of the head in the form of a pony, and the headdress was worn over the pony. Mayan used many objects to decorate and beautify their headdresses. In fact, headdresses were a form of art and Mayan nobility expended considerable resources and time in crafting their headdresses. Mayan used many objects to decorate and beautify their headdresses. In fact, headdresses were a form of art and Mayan nobility expended considerable resources and time in crafting their headdresses. Typically, the nobility would make their headdresses look like one of the animals popular in Mayan culture. These included Jaguar, Snake, Falcon or any other birds. Mayans would use jade and other objects to give their headdresses the relevant aspect of an animal. To top it, colourful feathers were used. These feathers were considered a prestige item and commoner were forbidden from wearing them in public. Feathers were the most treasured part of a headdress. Generally, Mayans preferred to wear such feathers in their headdresses which were highly colourful. Quetzal was among one of the most coveted birds in the Mayan society, usually hunted for its beautiful feathers. The colourful feathers of quetzal were specifically reserved for royalty in most Mayan cities, although in other cities the nobility at large used it in their headdresses. Ballgame was the most popular sport in Mayan cities. It was played between two rival teams in large ball courts. 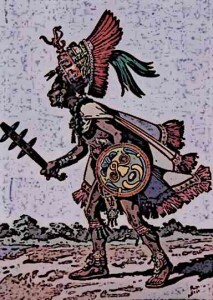 According to extant Mayan ceramics and art works, the players of each team often wore headdresses to distinguish them from each other in a game. Although Mayans used feathers and other decorative materials to adorn their headdresses, the basic structure of the headdresses was often made of wood or cloth. Many of the wooden headdresses were crafted in the shape of different animals. Sometimes, the animal depicted in the shape of a headdress also defined the lineage or occupation of the wearer. A military chief, for instance, would wear a jaguar headdresses because of the jaguar as a symbol of warfare in the Mayan culture. Mayans wore elaborate headdresses as part of their head gear. The use of such headdresses was limited to the nobility. Headdresses usually denoted the social importance, occupation and sometimes even the lineage of the wearer. The most beautiful headdresses made use of quetzal feathers. Only the royalty could use these feathers in their headdresses.